About the bears . . . When children arrive at Villa Toto, they'll find a teddy bear tucked up in their bed to greet them and make them feel at home straight away. The bears assemble in North Buckinghamshire (our English home) in the early spring and - as you can see above - pack themselves into a suitcase for their journey to France. We're not quite sure what they get up to when we're not there, but they have made a few short films for children who want to know about their holiday home and what there is to do at Villa Toto. 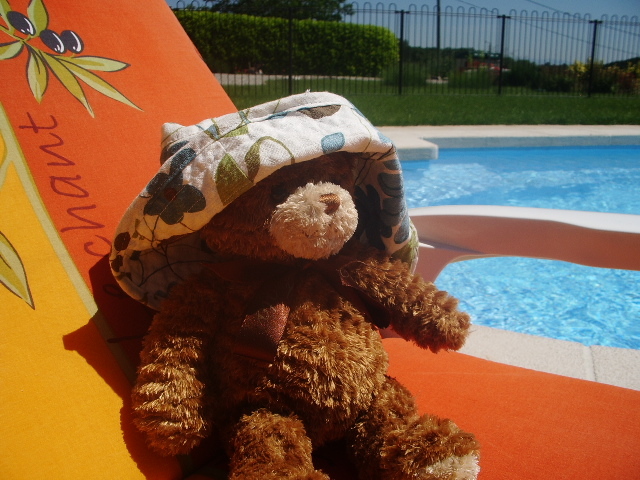 Waiting for the arrival of his new owner, here's one of the bears topping up his tan by the pool.